The University of Helsinki is the oldest and largest institution of academic education in Finland. The University of Helsinki seeks solutions for global challenges and creates new ways of thinking for the best of humanity. Through the power of science, the University has contributed to society, education and welfare since 1640. 1) The University of Helsinki aims to produce research of a high international standard in all fields. The University of Helsinki is a member of more than half of all national and Nordic centers of excellence in research. 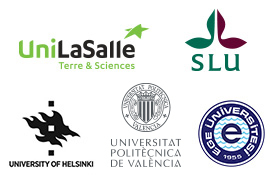 It is also the only Finnish university to have received an invitation to join the League of European Research Universities (LERU), which is an association of the leading research-intensive universities in Europe. 2) Teaching at the University of Helsinki is based on research. The underlying principle is that every teacher does research and every researcher teaches. According to an international evaluation, teaching at the University of Helsinki is of a high European standard. 3) The University of Helsinki boasts an extensive network of partners, including its alumni and friends, donors and funders, foundations and civic organizations, businesses and the media as well as political decision-makers and civil servants in the public sector. An international scientific community of 40,000 students and researchers. The Faculty of Agriculture and Forestry is an expert in the responsible use of renewable natural resources both in Finland and worldwide. The teaching and research focus on the agricultural, food, forest and environmental sciences, as well as on economics and management. The Faculty of Agriculture and Forestry is a great place to study for everyone interested in the responsible use of renewable resources both in Finland and globally. The Master’s Programme in Agricultural Sciences seeks solutions for future challenges in food and energy production. The University of Helsinki is the only university in Finland to offer academic education in the field of Agricultural Sciences. The Master’s Programme in Agricultural Sciences comprises four study tracks, allowing the students to focus on a specialization according to their interests and previous studies: Plant Production Sciences, Animal Science, Agrotechnology, and Environmental Soil Science. Producing sufficient food is one of the great challenges facing humanity. Plant Production Sciences have an important mission in finding solutions to this challenge. Plants are cultivated not only for food and feed, but also for bioenergy, green landscapes and ornamental purposes; Plant Production Sciences seek new, improved solutions for all these purposes. Plant Breeding is a form of applied genetics. Plant Breeding aims to increase the exploitability of plants and, on the other hand, offers an opportunity to respond rapidly to changing climate and opinion environments. The teaching includes the basics of plant genetics and application of biotechnical, molecular and population genetic methods in breeding. The aim is to give the students the competence to work as breeders and researchers both in Finland and abroad, so the studies include practical laboratory and computer class courses as well as practical training periods in research groups or companies.